Well, "too dumb to live" might be an unfair characterization. But dodos are legendary for their complete lack of a survival instinct when it came to humans. Turns out humans weren't the only threat they just never quite understood. Native to the island of Mauritius, dodos had evolved without fear of humans, because why would they? When humans did show up, their lack of caution made them easy prey for hungry sailors, even if by most accounts dodo meat wasn't very good. Since they were also flightless, the dodos had pretty much no defense, even if they had been able to work out that humans were bad news. Just eighty-three years after their first sighting in 1598, they were extinct, and they soon became the stuff of legend before 19th century research confirmed they had actually existed. Because pretty much the only people who ever saw dodos were sailors, not scientists, and because excavations from the 19th to mid-20th century weren't especially careful in preserving the recovered dodo remains, there's still a lot we don't really know about these poor creatures. That's why a new find by Smithsonian paleontologist Hanneke Meijer is so exciting. Since 2005, she and her team have excavating a site on Mauritius that was a small lake in the middle of a dry region thousands of years ago. They have turned up tons of small fossils there, and their latest dig has uncovered much larger specimens, including those of the dodo and a now extinct species of giant tortoise. More than three-fourths of the dodo bones unearthed—235 bones from at least 17 individuals, the researchers estimate—come from the legs and feet. Moreover, Meijer says, all of the bones are well-preserved, showing no signs of being exposed to the elements and no evidence of being gnawed by predators or scavengers. If the dodos had died of starvation or thirst, the researchers contend, their carcasses would have lain in the open before they were covered by sediment, leaving them exposed to weathering or scavenging. 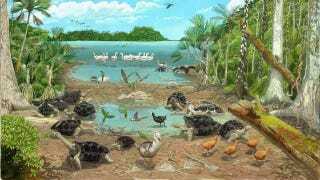 The best explanation for the dodo deaths, they say, is that the hefty, thirsty birds tried to cross the mud flats to reach the drought-shrunken lake and got mired in the muck. While the upper portions of the dodos would have been exposed—and therefore susceptible to decomposition or to scavenging—the legs, already buried, would have been more likely to be preserved intact. Meijer estimates that about 34,000 dodos got buried in this one region during the drought, suggesting that at least 33,999 dodos never quite figured out why it was a bad idea to walk across those mud flats. In fairness, there's also thought to be about 300,000 giant tortoises buried there from the same time period, so the dodos were far from the only creatures that were terminally slow on the uptake. For more, check out ScienceNOW. Original paper at Naturwissenschaften. Image by C. Julian Pender Hume.